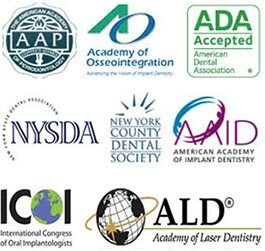 At our NYC dental implants center we use only the newest and most advanced dental equipment available on the market in USA. 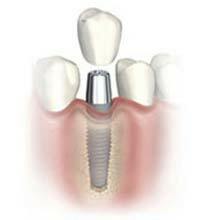 Dental implants are from Straumann, headquartered in Basel, Switzerland. It’s the largest and most advanced dental implant company in the world. We use the top quality medical grade titanium or titanium alloy dental implant components, the same materials used for other bone implants and for orthopedic joint replacements. Difference between titanium and zirconia dental implants. Alternative treatments include traditional dental implant or or mini dental implants procedures where the implants are covered up and left to heal or procedures where immediate load dental implants with a temporary prosthesis that will remain until the implants have healed and integrated with the jawbone. These may be more expensive and have their own advantages and disadvantages that will be discussed during your initial appointment with dental implants specialist in NYC, Dr. Rahmani. Dr. Navid Rahmani is a leading, best rated dental implant specialist in New York and one of few implant dentists in NY region to offer newest and most advanced dental implant options and latest procedures. Dr. Rahmani of NYC Dental Implants Center is located on Upper East Side, Manhattan. Who Can Have Teeth in an Hour? Teeth in an Hour can be a good solution for people who have lost all their natural teeth in either their upper or lower jaw or in both jaws. See other options for Replacing a Full Mouth of Teeth. It is also good for people facing tooth loss. With this technique, dental implants can be inserted into your jawbone and then immediately fitted with a new replacement bridge. At NYC Dental implants Center we suggest this treatment for anyone provided their jaws have finished growing and Teeth in an Hour can be particularly effective for people who have struggled with dentures for many years. It is important to have reasonable general health and people considering this treatment shouldn’t have any existing dental diseases, in particular gum disease or periodontal disease. There is no evidence to suggest the success of dental implant treatment is affected by age or gender. What Is the Procedure for Teeth in an Hour? In-depth consultation – Your treatment will begin with an in-depth consultation to assess your suitability for this treatment. During this consultation you will gain all the information needed for you to decide if treatment is suitable. The next stage is to carry out detailed diagnostics. Identify structure of facial muscles and jaw bones – To do this, Dr. Rahmani uses state-of-the-art technology that includes a Cone Beam CT scan to provide a 3-D image of your jaws. This is a specialized type of CT scan which produces a far lower level of radiation compared to conventional CT scans. The 3-D images produced by this scanner allow Dr Rahmani to identify all the important structures in your facial muscles and jaw bones. Produce a surgical guide – Special imaging software is used to plan the implant placements and to produce a surgical guide. This is a template that will be used during surgery to identify the exact positions of each dental implant. A surgical guide is important as it helps to eliminate errors and will ensure your surgery proceeds more quickly and more smoothly. Your new bridge will be fabricated before surgery even begins. Often we will use your current denture as a template to help design your new bridge, ensuring you will never be without teeth. The surgical process used to insert the dental implants is incredibly precise, using computer guided dental implant surgery to position the dental implants so treatment will be a complete success. This ensures drilling is very quick using the surgical guide fabricated during the planning stage. The implants fit precisely into implant sites created in your jawbone, eliminating spaces around the implants and helping to speed up healing. With this treatment, your pre-made bridge can be fitted straightaway. This bridge will be your permanent bridge and is non-removable. Surgery is carried out under just local anesthetic. There is minimal swelling with this technique and you should feel fine to return to work or everyday life the very next day. You will leave our dental office with your permanent teeth that are fully functional and which will look highly aesthetic. This treatment is cost-effective and requires fewer dental visits than for conventional dental implant treatment. You can choose to have your upper or lower jaw restored on the same day and your dental implants will help preserve your jawbone. You will need to have any tooth extractions completed before this surgery and any bone grafts must also be carried out beforehand. This may slow down the procedure slightly. The success rate for this treatment is very high, but is reliant on NYC implant dentist using computer guided surgery to precisely insert the implants to ensure they cannot move once loaded with your new implant bridge. The correct location also ensures the implant bridge can be made in such a way to look and feel very natural. Success is also dependent on patient compliance. Dr. Rahmani will give you all the instructions you need to look after your dental implants and to ensure they remain healthy and strong so they give you many years of trouble-free use. With all types of dental implant procedures, good daily oral hygiene is vital as without this there is a strong chance your dental implants will become infected and they could fail. Any changes to your general health may also affect the long-term success of treatment and should always be discussed with your implant dentist. What Is the Cost of Teeth in an Hour? The cost depends on the number and type of dental implants required and whether any tooth extractions and bone grafts need to be carried out beforehand. Treatment is very cost-effective compared to conventional dental implant surgery as fewer appointments will be required. Dr. Navid Rahmani is one of the best dental implant specialists in New York and a top rated NYC dentist. He is an internationally recognized Board Certified Periodontist.